My new life in Burgenland: Black Tea Bags, Biltong & A Plate For Two. A good start to our wine tasting weekend. Our friends arrived yesterday afternoon as they always do, with an excited hoot before turning up our driveway. They've been here so often that Eisenberg and its villagers are like a second home. Brilliant, isn't it? Bob was and is in charge of the itinerary and had us mingle only for a short time before herding us into the chariot for a trip to Welgersdorf to sample at his place of work. While catching up on a year's worth of life, we got a selection of presents from London. I nearly fainted with joy at a big box of PG Tips teabags ( as much as I love Austria, the translation of black tea is lost in the murky result of immersing it in hot water ), Bob salivated at the sight of two bags of Biltong which he bravely opened straight away despite knowing that our friends love it as much as he does. Just after half past four we drove the scenic route to Bob's work and we were all awed at the size and scope of it along with its flair, charm and individuality. For me the highlight was when Bob's boss came over straight away to greet him and of course us while filling our glasses with special vintages. Great stuff. Bob's other item on the to do list was supper at our favourite Hungarian restaurant which had one drawback...Hungary has a zero tolerance for alcohol while driving and so we did the rock paper scissor trick. Normally I can read Bob like an open book but yesterday he turned the page to a new chapter called: Biggi the designated driver! Bob had sent little teaser messages to our friends about the impending supper but even they couldn't have foreseen the size of it. The menu encompasses many lines of food and the two of us were translating the menu to them. Food groups could have been lost in translation and as a ploy to cover all the bases, I threw out the lure of the house platter for two never imagining them actually ordering it. Turns out they made a good decision but wore the wrong pants. The men shared this platter and it was comical to see the look on their faces when it arrived at the table. Honestly, it would have been ample for the four of us but you know how it is. We all want our own and the more the better. With a start like this, the next few days are going to be fabulous, fun and full of new memories. This almost conveys the size of it. 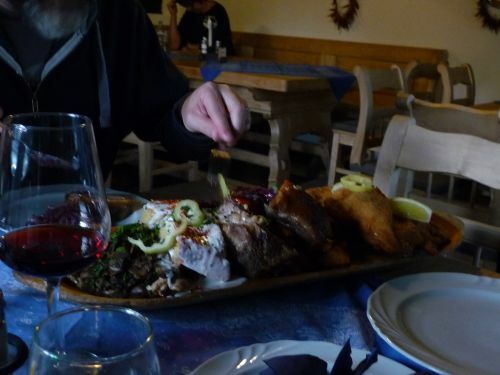 Isn't it amazing that this whole platter of food for two only costs 13 euros? Worth a trip to Restaurant Hatarmenti Vigado if you are ever in the area.